UPDATE 11/5/18: Kanye West gets cold feet facing the reality of moving beyond strong words to positive action. He also probably doesn’t much care for the hatred and destruction coming his way for not toeing the strict lines of Leftist racism. Candace Owens, on the other hand, remains a stunning, unstoppable heroine in the making. 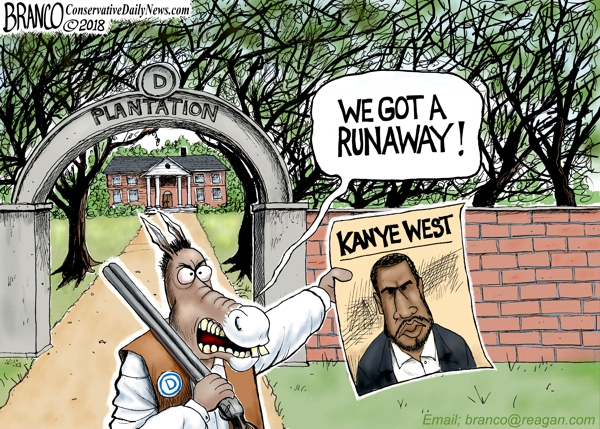 UPDATE 10/13/18: Stepping up the mockery & humiliation of uppity Blacks (sample Rolling Stone and Vanity Fair) refusing to kowtow to their Dem massuhs, the MSM goes full racist on Kanye West and his literal & political embrace of Trump…and the real solutions his policies offer Blacks and everyone else. 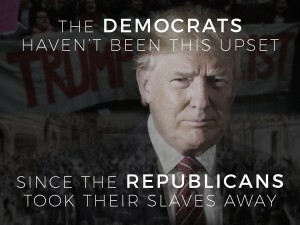 Black voters, walking away, is driving Dems to desperate measures. UPDATE 10/10/18: It is no surprise that free-thinking Blacks like Kanye West & Candace Owens are objects of scorn and racist taunts from (Black) eminentos of CNN. Once again: it’s not about Blacks. Or Gays. Or Women. Or genuine victims. It’s ALL about toeing the Socialist/Prog line. “I love the way Candace Owens thinks.” Kanye West. And what does she think? Watch this Prager U video and a few of her entertaining, funny, profoundly serious YouTube shorts. Strikingly clear-headed, attractive, visible personalities like Owens spell disaster for a political party offering nothing but one more generation of misery…and another one after that. But no longer. A prominent admirer of Candace Owens like rapper Kanye West resonates to her exhilarating message. He, like her, has tasted the joys of self-reliance and rejects the trap of government dependency. More are refusing to play the blame game and insisting on being treated as merely equals, not entitled victims. Add to that record low unemployment for everyone in a Trump-driven free market, and it’s very bad news for the Progressive slave masters undermined by one rapper’s power to influence his millions of social media followers. After being locked away from the notion of life, liberty, pursuit of happiness, one can only hope that the vital message of individual responsibility and a persistent willingness to fight life’s battles also gets through. No more Victims. Now Victors! Winners! Get the message? Another rather astonishing development is a recent statement by Radical Islamic fanatic Louis Farrakhan, praising Donald Trump for “destroying every enemy that was an enemy of our rise.” This historically unsavory source notwithstanding, if more Blacks are influenced to take on the rational, responsible road to self-improvement that Trump’s free market policies provide, there is great cause for optimism. 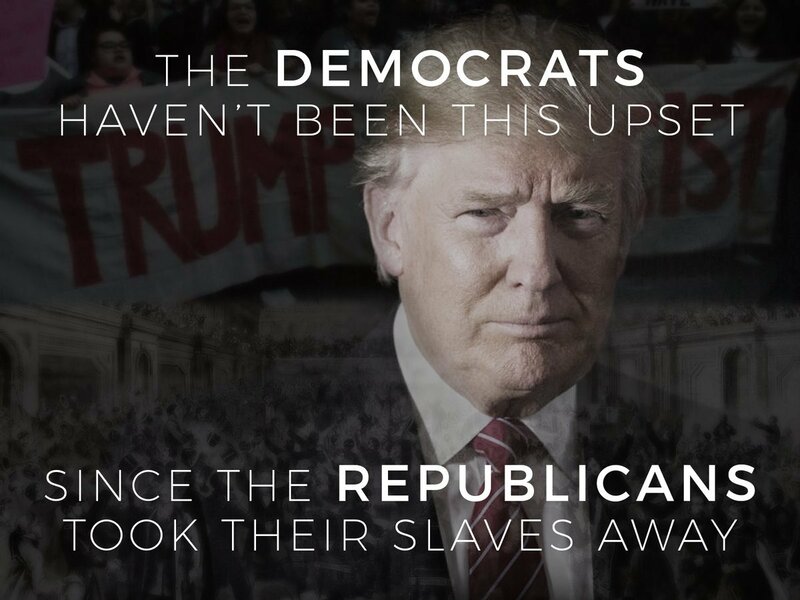 Naturally the more Blacks leave the plantation of patronizing Dem dependency, the more strident and louder the hysterical shrieks of Racist! Bigot! will be from the usual dark, dank places where dwell the sorry dregs of Dem leadership. Rising, self-reliant people of any color are career-enders for the Obamas, the Clintons, the Schumers, the Pelosis, the Jesse Jacksons and Al Sharptons, all grown rich, fat and powerful on the backs of the permanently weak, helpless, dependent. 4 Responses to Victorious Blacks leaving the Victim Plantation.